What is a Beurree Main? Ever wonder how the French get their soups and sauces to such a thick creamy state with a shiny texture? Many parts of French cuisine can be hard to replicate but the secret to a creamy soup is so easy a child could do it. Simply prepare a Beurre Manie. It's similar to a roux in that it's basic ingredients are just flour and butter but buerre manie isn't cooked. A roux can also be made of a combination of butter, oil, and herbs the "kneaded butter" goes for a much simpler recipe. Flour is often used as a thickening agent in cooking but just adding flour to soup would cause large doughy lumps. The flour wouldn't spread easily and it would make the dish unappealing. Roux and beurre manies are both used to thicken soups without the flour clumping. With the butter coating the flour you are able to add it to your soup or sauce without the flour getting thick and clumpy. As the butter melts it distributes the flour evenly as you stir it into your mixture. The French refer to the dough produced by mixing butter and flour "kneaded butter" because that's precisely what it is. As you will see from this how to making your own beurree main may be a bit slippery but it's also really simple. Use your beurre manie to thicken soups, stews, and sauces. 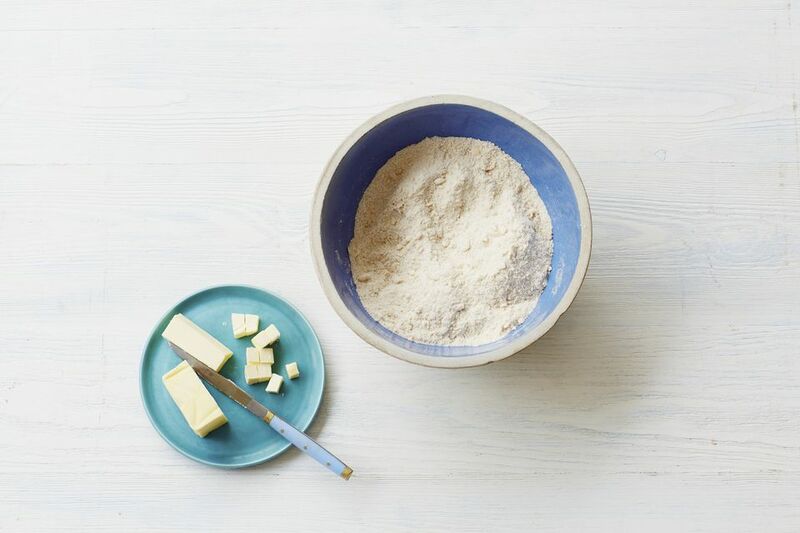 Start with 1 tablespoon of all-purpose flour and 1 tablespoon of softened butter. It's best to just leave the butter out for an hour or so before you begin. Don't microwave the butter. Work the butter and flour together by hand. The beurre manie will be a sticky, slippery mess; continue kneading. It's not pretty, but once the flour is incorporated into the butter your beurre manie is done and ready to slip into stews, soups, and sauces. Be sure to continue to whisk your soup or sauce until the beurre manie has been completely mixed into the meal. You'll want to do a taste test to be sure if it hasn't been mixed in completely you will still be able to taste the flour. Once you can no longer taste the flour and it has reached the desired thickness your soup is ready. If this method is just too messy for you, you can also work the butter and flour together with spoons or a rolling pin. Others prefer to use a food processor, just make sure it doesn't run hot and cause the butter to start to liquefy. Fortunately, you can freeze beurree manie for up to three months. As most recipes only call for a tablespoon or two of this ingredient at a time you can freeze whatever you don't use. It can also be made in large batches and frozen. However, it's important to allow the mixture to fully soften before adding it to a soup. We don't recommend adding frozen beurree manie to a hot dish.